USA's Joshua Farris performs to "Clair de Lune" at the 2012 World Junior Figure Skating Championships. 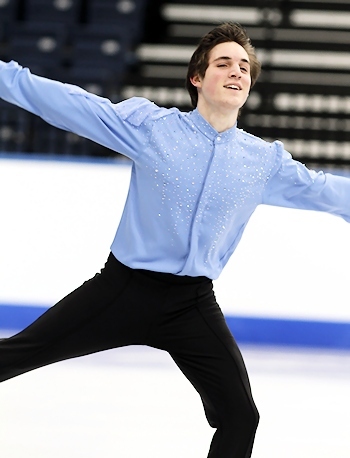 USA’s Joshua Farris leads the Men at the 2012 ISU World Junior Championships in Minsk, Belarus after the short program on Thursday. He is closely followed by China’s Han Yan and Kazakhstan’s Denis Ten, respectively. Farris’ sophisticated program to Clair de Lune, was highlighted by a strong triple Axel, a triple flip-triple toe, and three level-four spins. The only minor glitch was a slightly shaky triple Lutz. The ISU Junior Grand Prix (JGP) Final bronze medalist earned 75.43 points, just below his season’s best. Yan hit a nice triple Axel, a triple flip-triple toe combination, a triple Lutz, and showed good flow in his program to Waltz No.2 by Dmitri Shostakovitch. That meant a new season’s best (74.88) for the JGP Final silver medalist who also received the highest component score. Ten turned in an elegant performance to Rachmaninov’s Elegie op. 3. He landed a beautiful triple Axel, a triple flip-triple toe, and a triple Lutz. However, his spins let him down. While the change camel spin earned a level four, the flying sit was wobbly and the combination spin merited only a level one. The 18-year-old collected 73.78 points, four points lower than his season’s best. USA’s Jason Brown currently sits in fourth place with a season’s best of 70.20 points. He showed off his musicality in his fast paced Tango Grand Guignol, but didn’t go for the triple Axel. The JGP Final Champion landed a solid double Axel, a triple flip-triple toe, and a triple Lutz. The flying sit and combination spin merited a level four, while the change camel (which was well done) only garnered a level two. Brown is not planning to do a triple Axel in the free skate. Russia’s Zhan Bush stepped out of his triple Axel and also did a three-turn between the triple flip and triple toe in his combination to score 65.21 points. He Zhang of China came in sixth with a clean performance to Blues Brothers and Sing Sing Sing. He produced a double Axel, triple flip-triple toe, triple Lutz, and fast spins for a score of 64.63 points. Liam Firus of Canada also skated clean, however, his limited difficulty with a double Axel and a triple toe-triple toe didn’t allow him to finish higher than seventh (62.10). Russia’s Artur Dmitriev of Russia fell on an underrotated triple Axel to finish eighth (59.36 points). USA’s Timothy Dolensky was ninth (57.73 points) with a triple loop-triple toe combo. The diminutive, but very lively Shoma Uno of Japan was 10th. He got an edge call for the triple Lutz and landed a triple flip-double toe. Defending World Junior silver medalist Keiji Tanaka of Japan disappointed with a double flip-double toe and faded to 11th at 57.70 points. The backward outside death spiral was invented in 1928 by Germany’s Charlotte Oelschlägel and Curt Neumann (although it was first performed with the skaters holding both hands and the woman not fully lowered toward the ice). They performed the first one-arm death spiral in Budapest in 1928. Canadian pair Suzanne Morrow and Wallace Diestelmeyer are credited with being the first pair to perform the element in competition at the 1948 Olympics. Ludmila Belousova and Oleg Protopopov (USSR) are credited for creating three versions of the death spiral: Cosmic spiral (backward inside), Life spiral (forward inside), and Love spiral (forward outside).